Just like their modern day counterparts, the supermarkets, late 19th and early 20th century grocers sold soda pop to supplement their regular incomes. A number of them became so successful marketing soda pop that they quit the grocery business and went into the full-time manufacturing, bottling, and marketing of their liquid assets. This became a lasting enterprise for some, while others wished they had stayed in the grocery business. A few who did not regret their decision to change include Jacob Brecheisen of Kenton, Ohio, Michael J. Eagan of Crystal Springs, Mississippi, and James M. Keen & Son of New River, Tennessee. Let's take a look at the Keens. James Marion Keen was born June 20, 1842 in Overton County, Tennessee to John H. and Jane Johnson Keen. The Keens were among the county's first settlers during the 1830s. James grew into adulthood and married Virginia Mabry (born February 6, 1851) in Clay County, Tennessee. They became the parents of five children: Willard, Maude, A. Y., Emett, and Flora. In 1875, James moved his growing family to Scott County, Tennessee, where they lived in a two-story, frame building in the Huntsville County seat and established a successful mercantile business. The family's happiness was shattered in 1880 when Maude died at the age of three. In 1890, James Keen bought a half-interest in the P. M. Smith store in New River, Tennessee. The store sold everything from $1 brogans (shoes) to lard at just 10 cents a pound. They also marketed "Stories' Flux Mixture," which was supposed to cure the flux, cholera, morbus, and virtually any other ailment. James eventually bought out Smith. The Keens became members of the Presbyterian church and James served as an elder in the congregation. He was also a Mason and a member of the Independent Order of Odd Fellows. Politically he was a Democrat, but later became a Republican. His mercantile business in Huntsville and New River became busier and his son, A. Y., soon joined the firm. 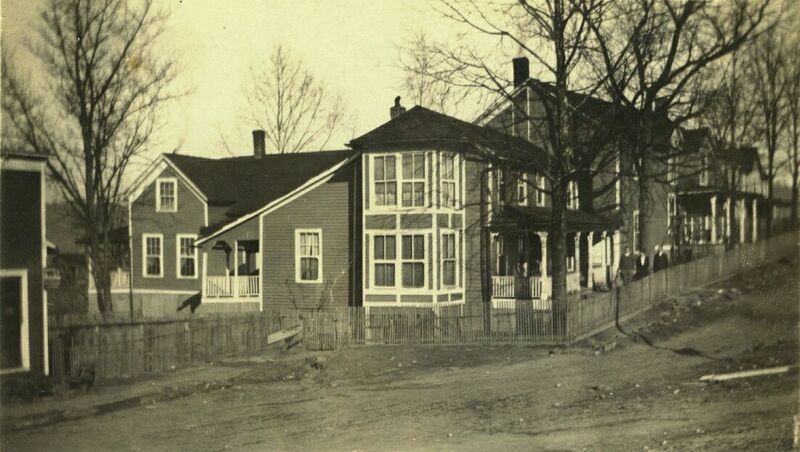 James bought a large house next door to his New River mercantile store and renamed it the Keen Hotel. It served as the family's primary residence. In 1905, a two-story addition was built to accommodate visitors and traveling salesmen called "drummers." In early 1906 James Keen entered the soda bottling business. On February 18, 1906 he sent his son A. Y. Keen and John McCoy to South Pittsburg, Tennessee to start up the new venture. Named the Keen Bottling Company, James was the company president, while A. Y. was secretary-treasurer. By April, 1906 the bottling company was up and running, doing a brisk business marketing Koca Nola, Cascade Ginger Ale, root beer, and sodas in many fruit flavors. A. Y. had wed the former Willie Hall and she and their son, James William Keen, settled into their South Pittsburg home. I am pleased to note that you are getting along well and certainly wish you the greatest success. It seems to me that you ought to be able to make some money there. I would warn you not to drink too much of the Koca Nola and in fact I do not believe too much of the carbonated beverages good for you. You will have to be careful about what you eat and drink if you have good health there. Did Willard know something about the drink that others didn't? When the soda bottling company in South Pittsburg prospered beyond expectations, James Keen, along with his sons A. Y. and Willard, decided to open another soda bottling works. This one was located in New River, Tennessee and would serve as the home office. It became operational in late 1906. The company sold Koca Nola in clear and amber crown top bottles embossed REGISTERED / KEEN BOTTLING COMPANY / Koca Nola (in script) / NEW RIVER AND / SOUTH PITTSBURG / TENN. inside a round plate mould (photo courtesy of Bill Baab, Augusta, Georgia). 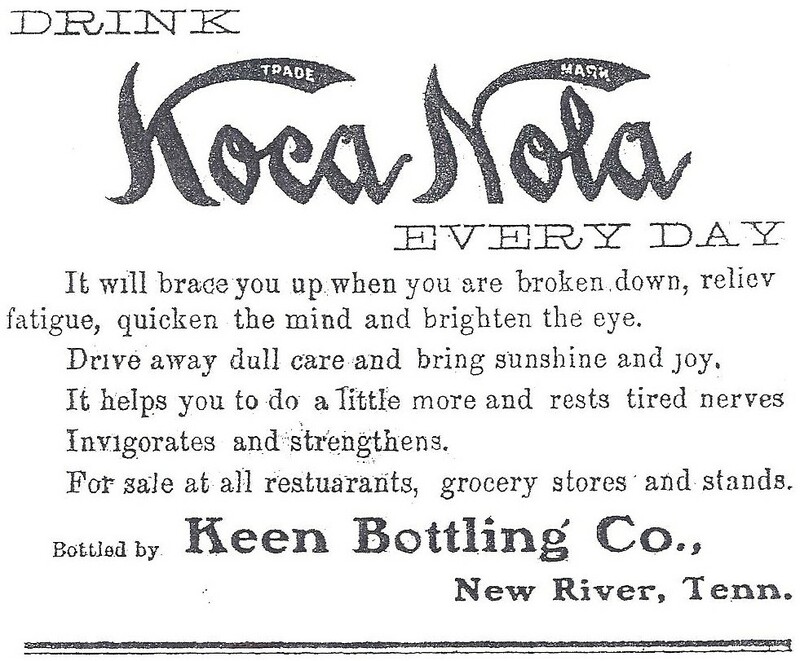 Three undamaged examples of the bottle are known, and this is the only Koca Nola bottle bearing two town names. Note: July 15, 2010, a near mint example of the New River and South Pittsburg, Tenn. amber Koca Nola bottle drew 30 bids during an on-line auction and sold for $525.89. This is a new record amount paid for a Koca Nola crown top bottle! Congratulations to the new owner who added a wonderful bottle to his/her collection, and our thanks to the seller for quoting (and properly citing!) historical information from KocaNola.com! 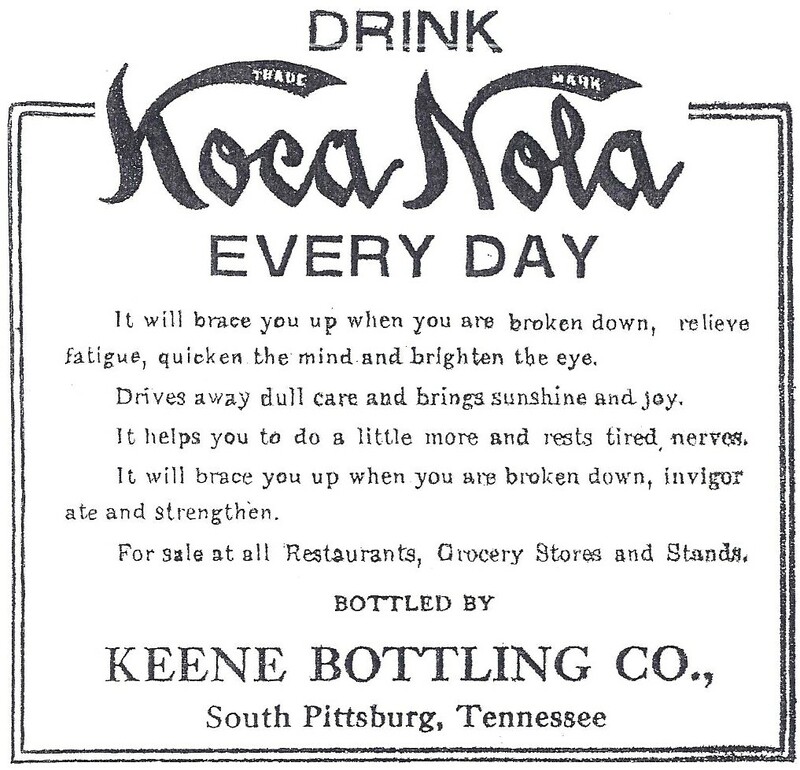 A May 17, 1907 advertisement in the South Pittsburg Hustler claimed that Koca Nola would "brace you up when you are broken down, relieve fatigue, quicken the mind and brighten the eye." The Keen Bottling Company purchased supplies from numerous vendors, including the Liquid Carbonic Company, Crown Cork & Seal Company, W. H. Hutchinson & Son, the Carbonic Acid Company, and Blumenthal Brothers. Place 40 pounds granulated sugar in a stone jar. Dissolve one ounce sweetener in 1 gallon water. Pour over sugar and stir, then add enough water to make ten or eleven gallons finished syrup. The Keen company and other contributors received free copies of the book, The Bottler's Helper. These similar advertisements appeared in the South Pittsburg Hustler June 28, 1907 and August 9, 1907(image courtesy of George Zepp) and the Cumberland Chronicle August 10, 1907 (image courtesy of Ms. Irene Baker). A special THANK YOU to Dennis Smith for cleaning up these 100+ year old images! A. Y. Keen utilized a teal green crown top bottle embossed KEEN BOTTLING CO. / SOUTH / PITTSBURG / BRANCH to market the firm's other soda waters. Paper labels placed on the back of the bottles identified the contents as ginger ale, root beer, or other pop flavors. By August of 1909, the company was offering Rye-Ola, a soda manufactured from a "wholesome vegetable compound" and guaranteed "not to have a single harmful or deleterious drug or matter in its contents." Meanwhile, the company home office managed by James Keen in New River continued to prosper. However, tragedy once again haunted the family. A. Y. 's 26 year old older brother, Emett, died in 1906, followed on December 14, 1907 by the death of James M. Keen at age 65. A. Y. inherited the business in New River and Huntsville, as well as the Keen Hotel. Willard also came in for a share of the business and, rather than leave his career as an attorney, appointed A. Y. Keen to manage his interests in the two mercantile stores and bottling business. By late 1909 or early 1910, A. Y. opened another plant in Oneida, Tennessee, bottling the same sodas, including Koca Nola, sold at the other two plants. The latter drink was sold in amber crown top bottles of which only two undamaged examples are known. 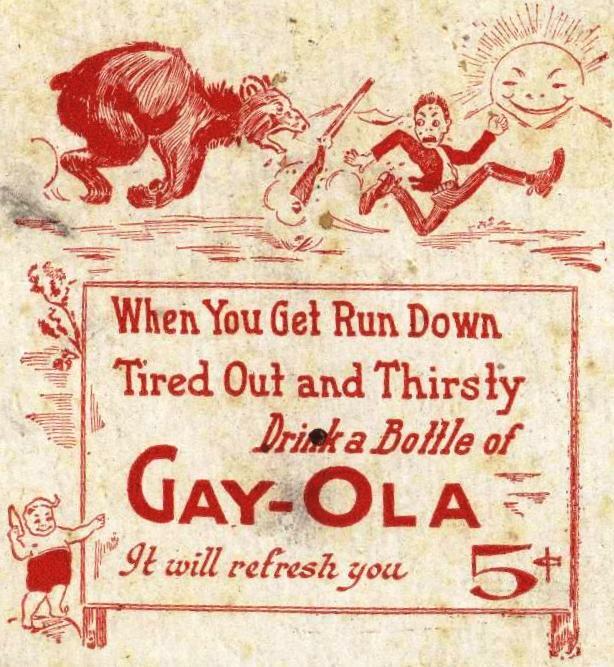 By 1911, the Keen Bottling Company received the Gay-Ola franchise. Ice was also sold at the Oneida plant. 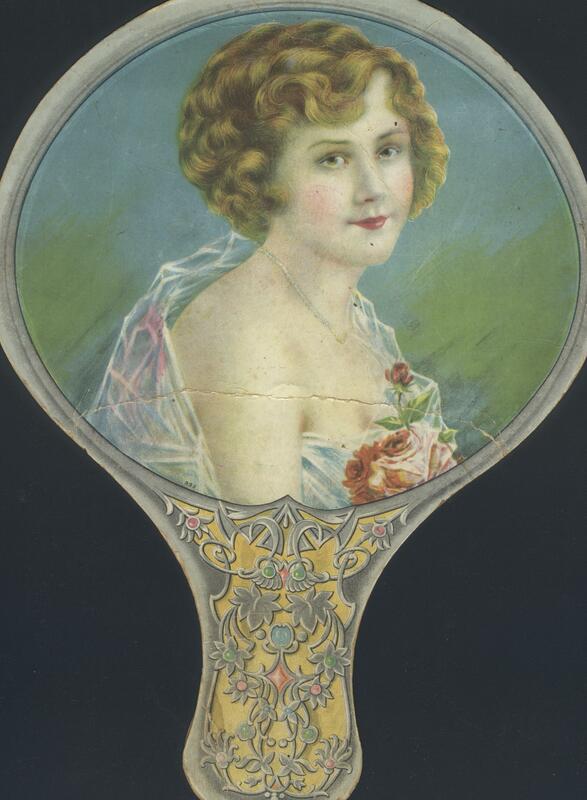 By 1910, Koca Nola was on its way out. Federal authorities had intercepted a jug of syrup and its chemists determined it contained cocaine. Appeals by the Atlanta-based company followed, but it was soon history. In the meantime, Gay-Ola exceeded all expectations and it became the Keen company's best-selling soda, so much so that A. Y. renamed his company the Keen Gay-Ola Bottling Company and used the name on amber and aqua embossed crown top bottles. The company also gave away many premiums associated with the drink, including watch fobs, fans, pocket mirrors and the like. In 1917, A. Y. added Orange Whistle to the Oneida factory line of soft drinks and Reif's Special at the New River plant. The South Pittsburg branch had been closed for several years, perhaps because of stiff competition from the Coca-Cola Company in Chattanooga. Coca-Cola had been marketed in South Pittsburg as early as 1904, but it wasn't until 1914 that the town obtained its own Coke franchise. In 1912, Willard Keen was appointed U. S. commissioner and also served as clerk and master of the chancery court in Huntsville. He continued to act as legal counsel to the Keen Bottling companies of which he was part owner. His sound advice to A. Y. to incorporate the Oneida Gay-Ola Company was just one example of his expertise. On February 1, 1922, Willard moved his family to Chattanooga where he became a general agent for the State Mutual Life Insurance Company. 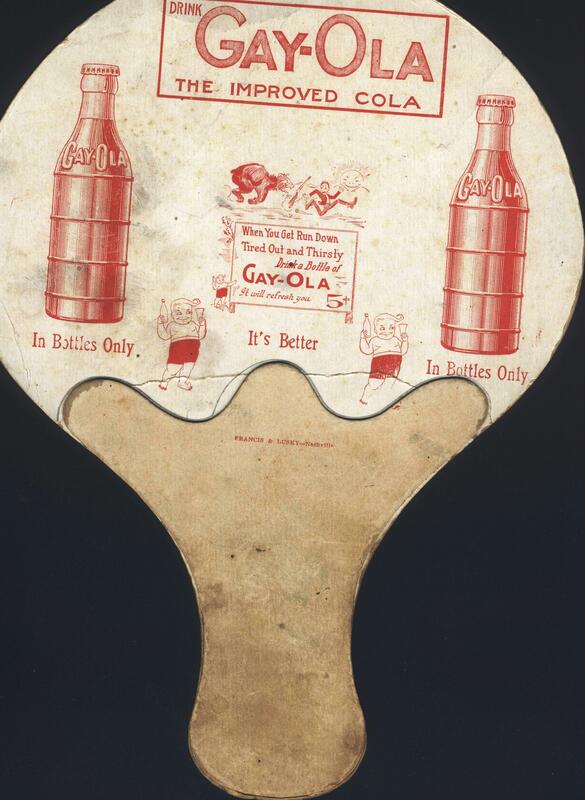 Around the spring of 1922 A. Y. opened another soda bottling plant at Oakdale, Tennessee, mainly bottling Gay-Ola. 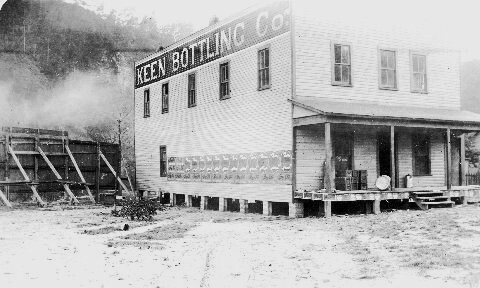 George Zepp provided the following 1912 image of the Keen Bottling Company building located in New River, Tennessee. For a brief time in 1923, A. Y. partnered with George Strunk to sell cigars, cigarettes, plug tobacco and snuff, but the partnership didn't last. In April 1927, A. Y. opened a gas station at the Huntsville store because of the increasing number of automobiles in the area. That same month he began bottling and marketing the new NEHI soda at the Oneida plant and even renamed the company the Keen NEHI Bottling Company. NEHI was sold in nine different flavors and was a huge success thanks to an aggressive advertising campaign. He sold and delivered ice made from distilled water as well. 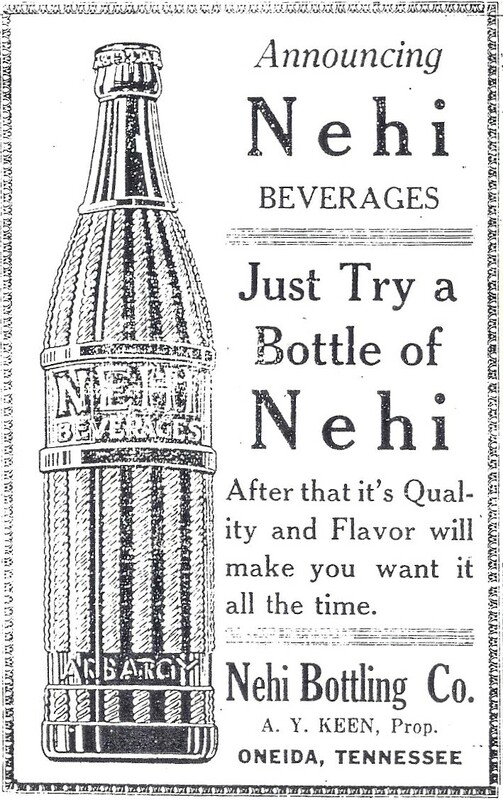 NEHI advertisement from the Scott County (TN) News, April 23, 1927. During the early hours of April 30, 1929, A. Y. 's son, Walter, went next door to the family's mercantile store and built a fire in the stove as had been done for years. He returned home for breakfast when a passerby discovered the store was on fire. The blaze, which may have originated from a faulty flue, destroyed the building and contents. In addition to being successful businessmen, A. Y. and Willard Keen were pillars of the communities in which they lived. Their soda bottling companies lasted 25 years during an age when Coca-Cola and Pepsi-Cola were fast driving small bottlers out of business. The Keens also owned and operated two mercantile stores for more than 50 years. Research into the Keen family archives did not reveal if the New River store was insured, or if it was rebuilt. In fact, I haven't been able to find a trace of the bottling companies beyond the early 1930s. It is likely that the Great Depression was just too much for them to survive. REFERENCES: Bill Baab, Augusta, GA; Irene Baker, president, Scott County Historical Society, Huntsville, TN; Ron Fowler, Littlerock, WA; Robert Hookey, South Pittsburg, TN; Wallace F. Jannsen, Food & Drug Administration historian; Dr. Cecil Munsey, Ph.D, Poway, CA; Paul Roy, Oneida, TN; Dennis Smith, Buffalo, NY; George Zepp, Rugby, TN; Craig Reed, Helenwood, TN. NEWSPAPERS: Scott County (TN) Call, June 24 and September 16, 1887; South Pittsburg (TN) Hustler, May 17, 1907, June 28, 1907, August 9 & 10, 1907, August 20, 1909; Scott County (TN) News, September 21, 1917, April 22, 23, 29, and December 21, 1927, and May 3, 1929; Cumberland Chronicle (TN), August 10, 1907. BOOKS: A History of Tennessee and Tennesseans, by Will T. Hale and Dixon L. Merritt, 1914; The Bottler's Helper, by Blumenthal Brothers, 1907, reprinted 1993 by Ron Fowler (visit SeattleHistoryCompany.com for additional information). MAGAZINES: "A History of the Keen Family Bottling Companies" by Charles David Head, June 2004, Antique Bottle & Glass Collector. AUTHOR'S NOTE: I collect embossed soda bottles from the Keen companies and am interested in buying Keen company bottles. A book detailing the Keen family's history is now in the planning stages. I am interested in learning more about the family's history. Anyone wishing to contribute information to this project, especially Keen family heirs, are invited to contact me via snail mail address posted on the Contact Us page.